“Yahoo” the one among the top in meshing up the users with messages and mails prominent among others service, now tuned with some new changes presenting a presentation "faster mail service" yahoo mail. 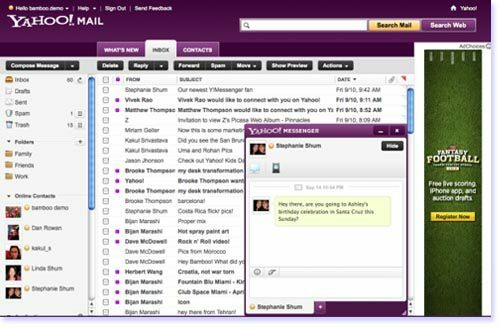 Yahoo made some key changes to one of its most important products, rolling out a new look for Yahoo Mail. Blake Irving, the company's new executive vice president and chief products officer, unveiled the new design at Yahoo's headquarters in an event 'Product Runway.Irving said,'Mail has been re-architected from the ground up'changes both under the hood and to the look and feel of Yahoo Mail should result in a much faster experience that works across multiple devices. The company will also integrate instant-messaging and SMS into the main Yahoo Mail in-box, and let Facebook and Twitter users see updates on the landing page for Yahoo Mail. as it rolls out an opt-in beta version of the service, results key drivers of traffic to Yahoo's array of news and entertainment Web sites. Yahoo also introduced plans to blend news and entertainment content more prominently within search results, but the event was mostly a strategy-oriented presentation from Irving, Yahooo, Go go.., start your mailing faster with Yahoo.